On a snowy day in February 1967 Walsall Corporation trolleybus 353 is on a short working to Leamore. 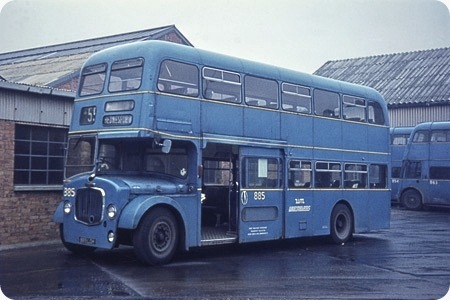 The vehicle was an ex-Ipswich Corporation Sunbeam F4 with Park Royal body which was acquired with seven others due to the closer of the Ipswich Trolleybus system in 1962/3. In the background is the Carl Street entrance to Birchills depot. The Ipswich destination box was an odd shape and it is strange how Walsall retained it, even going to the trouble of having blinds made to fit. With Walsall’s flair for bodywork rebuilding one would have thought they would have rebuilt these to their standard layout. Accommodating the long word ‘Wolverhampton’ on these blinds meant writing the word diagonally. 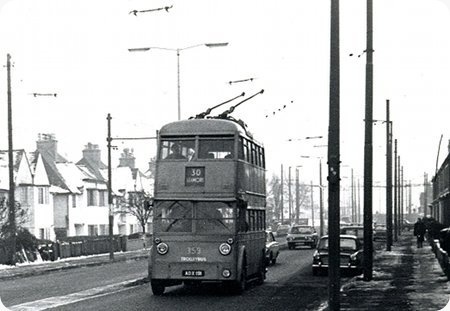 Used to live about there on Bloxwich Road – watching some of the conductresses trying to switch the points into Carl Street could be amusing, but the sound of a trolley bus starting off from the stop outside our front window has lived with me for 60+ years …. Former Walsall Corporation 341, by August 1970 owned by the West Midlands Passenger Transport Executive, leaves Walsall Bus Station for Blakenhall. It is a Sunbeam F4 with much rebuilt Brush body and should be showing route 15. In the background is former Birmingham City 2593 registration JOJ 593, a 1951 MCW H54R bodied Guy Arab IV, transferred to Walsall in February 1970 with others to partially replace the trolleybuses, though it and its sisters were as old as the vehicles they replaced! Nice view, Tony. Thanks for sharing. Others on this site have commented on the full front Vs half cab arrangement of motor buses, citing the amount the driver could or could not see on his nearside – among other factors – yet MOST trolley buses were full front. Just speculation but I wonder if the use of full fronts on most trolleybuses was to protect the control gear from water ingress as this was generally on the bulkhead where the engine would be on a motor bus. Surely, Pete, the driver of a Trolley knew that the nearside window was the limit of its width, whereas the problem in the half cab was that the front nearside corner disappeared if a high bonnet obscured the mudguards? Anyone know first hand? Presumably the mirror, if mounted on the nearside corner was a help. Do you remember when you, the driver, could see the front of your car?! Actually, Joe, the discussion I remember was about how much less the driver could see with a full front! In the event, the rear engine came along, with the door directly opposite the driver, and the argument was stifled. There was a similar sort of discussion when I was working, and about half the folk who commented said they liked the tip-up seats in shelters and the other half hated them. They went off the market after too many people fell off and the makers’ insurance company jacked up the premium. In a way, I suppose, those who hated the things won. I wonder if the issue with full front buses was steaming up in that awkwardly inaccessible left hand cabin. This would probably be more of an issue with the rising emissions from internal combustion engines than the drier warmth from electrical machines. This would not be a problem with rear engine buses of course, and the passenger door gave easy access to the nearside front screen if necessary. I guess everyone will know that the original fleet of Notts & Derbys trolleybuses were half-cabs. I have heard that the cabs of Walsall’s F4As, with their curved glass windscreens gave excellent visibility. There is one behind 341 above and my photo of 872 which is elsewhere on this site. A lot of early t/buses were halfcab, because they probably thought they should look like buses. Some even had fake radiators. The 1931 London ‘Diddlers’ were halfcab with a central headlamp on the bonnet front, a la trams! 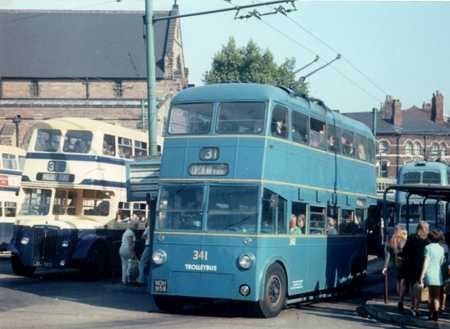 The Notts & Derby trolleybuses that Stephen refers to had the motor and associated electrical equipment under the bonnet (with ‘dummy’ radiator with the AEC/English Electric badge attached). The London United ‘Diddler’ trolleybuses also had the motor under the bonnet but no attempt was made to provide a ‘dummy’ radiator but there was a single headlamp in the panel where a radiator would have been. There were other instances of trolleybuses with half cabs – Birmingham Corporation for example. Most trolleybuses had the motor located between the chassis side members under the lower saloon floor with a short prop shaft to the rear axle. With this arrangement there was no need to provide a half cab arrangement and the nearside of the full width cab was usually taken up with the contactor cabinet, although some operators, like London Transport, opted to have the contactor cabinet mounted on the nearside of the chassis with access via flap in the vehicle’s ‘skirt’ (or ‘valance’ – depending on which term you choose to use). In Bob Rowe’s new, 2018, book on Walsall Trolleybuses, there is a copy of the tender for the bodies of this batch. Especially interesting is that the Corporation specified that the seats should be covered in leather made in Walsall.